Matlock U17s celebrate their win. Matlock Town under-17s have won the NPL Chryso league title with a 100-per-cent winning record for the season. The Young Gladiators secured the honour on Wednesday afternoon against secondplaced Radcliffe Borough (Black) after just eleven games. This is Matlock’s second NPL Chryso title in as many years as the change in youth set-up two years ago continues to pay dividends. With three fixtures remaining the youngsters have amassed 33 points to leave them a 12 point gap at the top of the table. To secure the title they were tasked with avoiding defeat against second placed Borough, which they did in cool fashion. First-half goals from Luke Day and Lukas Brough put Town in pole position to claim victory, added to that a goal clawed back from Borough and a second goal from Day in the second-half the three points and title were Matlock’s. The title win comes off the back of the reserves’ retaining of the Derbyshire Divisional Cup North and the impressive exploits in the Netherland at the Holland Cup. Add to that the inclusion of Alfie Smith-Eccles, Ethan Knowles and Brough in the NPLFA Team of the Year, and it has been an outstanding couple of weeks for the development system. Development manager, Justin Tellus, was delighted for the players and the academy after their impressive season and title retention, labelling the successes as a result of the new system. “It’s a fantastic achievement from the young players and hard-working technical staff, while to become league champions with games to spare as well as being unbeaten makes it all the more special. “This is the result of a new development recruitment system we put into place last year, were we have set up an internal system working closely with football league clubs and grass root scouts. “Our U17s had a good pre-season in Scotland and brought that hard-working form into the season that has continued to achieve them success both at home and abroad in Holland. “There have been so many outstanding performers, but the collective team work has carried them through to the league title”. Tellus isn’t ready to leave the academy achievements at that and has targeted further improvements to be made within the Matlock ranks. 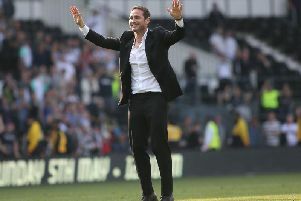 “In my two and a half years as development manager we have now won seven major titles that include two league titles, two Derbyshire Cups and three international tournaments, as well as reaching five major finals as runners-up, with two more finals to look forward to this May,” he explained.